There’s no bad time of the year to visit Japan, but after making the trip this fall, I was reminded just how magical the season really is. 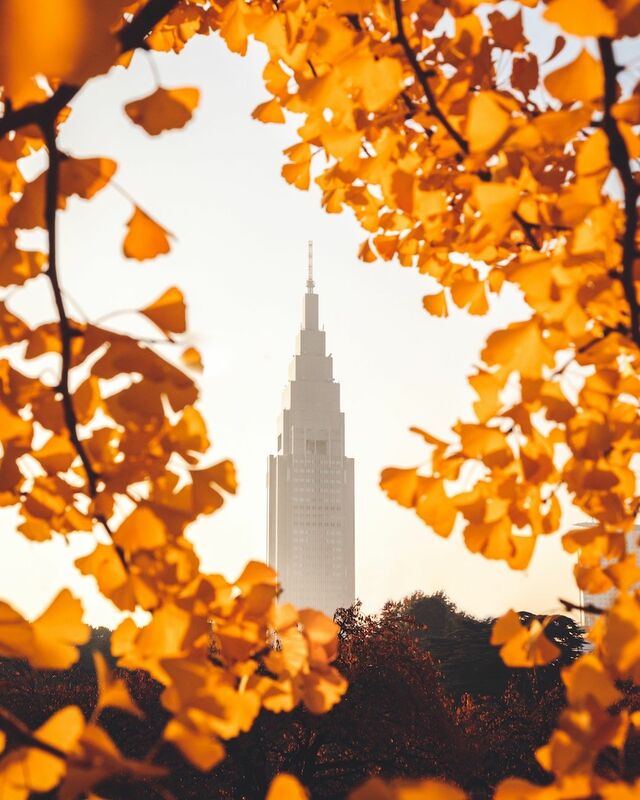 Known worldwide for the koyo, autumn-colored foliage, the country is a palette of yellow, orange, and red from September through November. Unlike the spring cherry blossoms, which can sometimes bloom only for a week, the koyo can be viewed for several months. To do fall in Japan right, here are 10 spots you need to check out. Experience the natural beauty of Mt. Fuji by hiking around the Fuji Five Lakes. These five lakes are Kawaguchiko, Saiko, Yamanakako, Shojiko, and Motosuko, and they’re some of the best vantage points from which to view Mt. Fuji up close. When you’ve finished your hike, you can go camping, fishing, or enjoy one of the area’s hot springs. 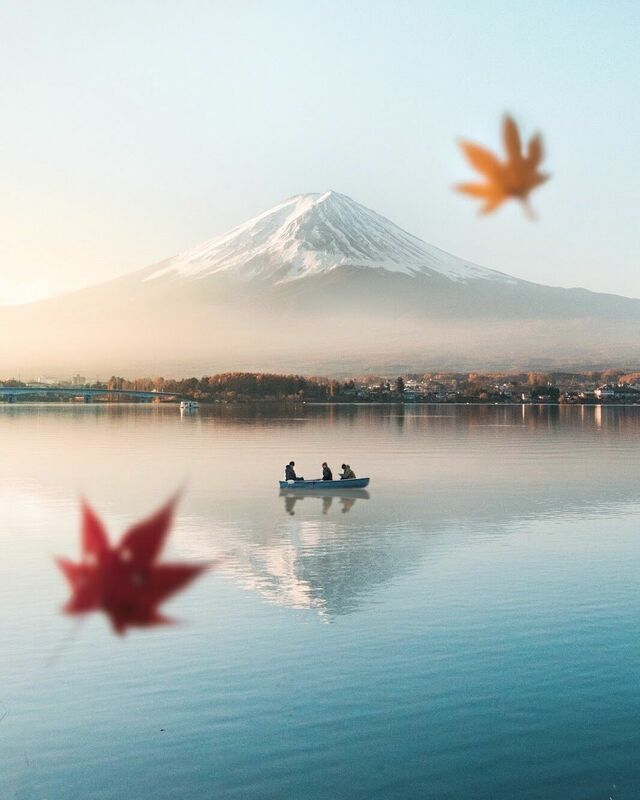 Just two hours away from Tokyo, the Fuji Five Lakes make for a perfect weekend excursion. There’s more to Hiroshima than tragic history, as you’ll quickly find when you explore Hiroshima Castle. 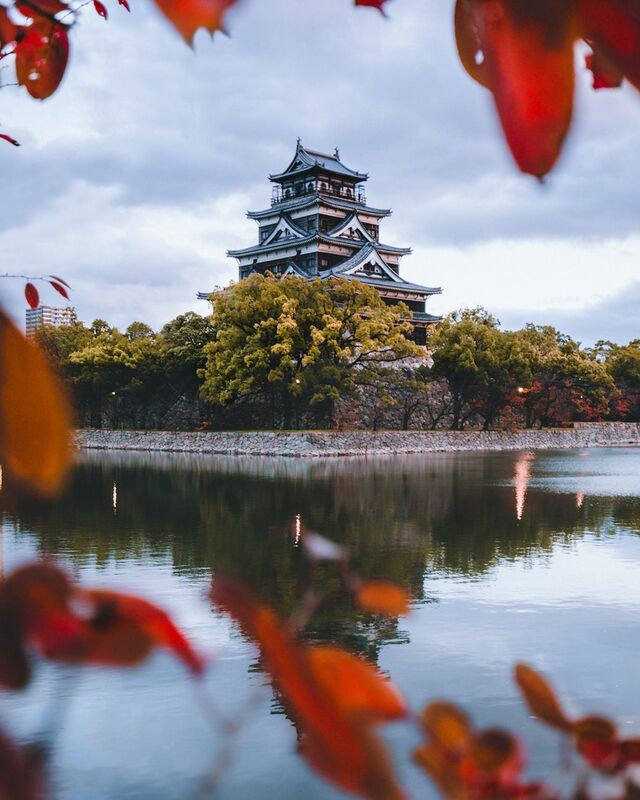 While the original castle was built in 1589, as the centerpiece of feudal Hiroshima, it was destroyed by the atomic bomb and rebuilt in 1958 as a museum of pre-WWII Japanese history. From the castle’s top floor, you’ll enjoy panoramic views of Hiroshima and the surrounding countryside. 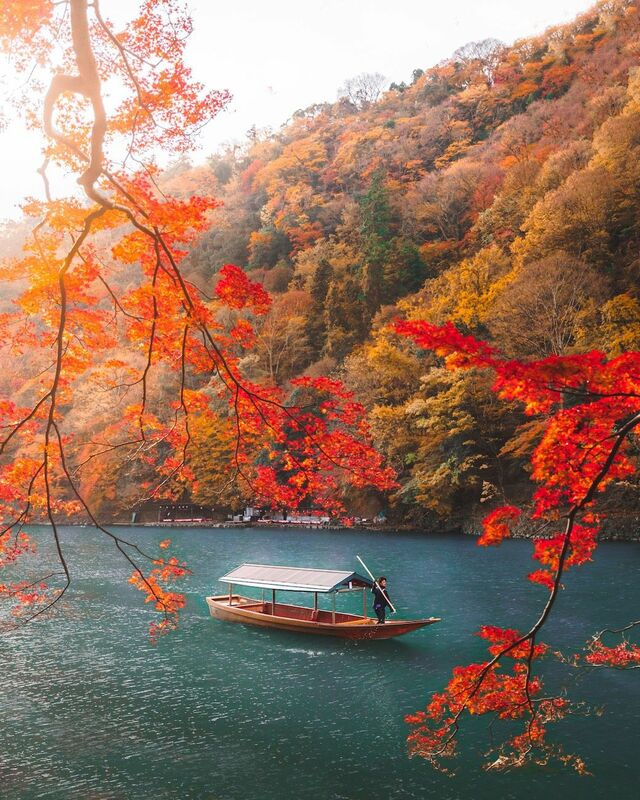 Just outside the bright lights and busy streets of Kyoto, Arashiyama is a small village where fall shines bright. As the home of the famous Togetsukyo Bridge, Arashiyama’s downtown is bustling with tourists, but if you venture upriver to Kameyama-koen Park, or into Tenryu-ji Temple and the Bamboo Grove, you’ll find both solitude and natural beauty. The Bamboo Grove is especially memorable, with stalks of bamboo as tall as trees, and a colorful fall canopy overhead. Arashiyama is just 30 minutes from the center of Kyoto, and easily accessible via train, bus, bicycle, or taxi. 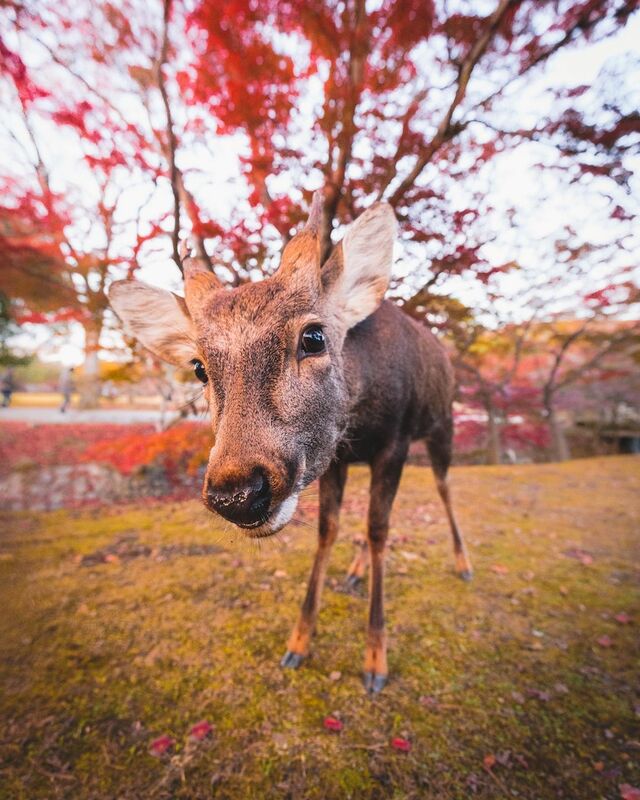 One of the best ways to immerse yourself in koyo is spending a day in Nara Park, at the foot of Mt. Wakakusa. The park is filled with over 1,200 wild sika deer, who roam freely around the 1,240-acre park. There are also private gardens and the nearby Nara National Museum. Walking around the park, you’ll quickly realize why fall in Japan just isn’t complete without Nara’s colorful forests. When you’re finished, take a quick rickshaw ride to Tōdai-ji or Kōfuku-ji, two Buddhist temples. One of the best (and lesser-known) spots from which to view Mt. Fuji is the Chureito Pagoda, 400 steps up a mountainside overlooking Fujiyoshida City. It was built as a peace memorial in 1963, as part of the Arakura Sengen Shrine, and it’s particularly striking in the fall, when the mountain’s foliage changes color. Since it’s not quite as heavily-trafficked as the five lakes, you’ll enjoy some peace and quiet here, and an ideal setting to watch the sun set over Mt. Fuji. 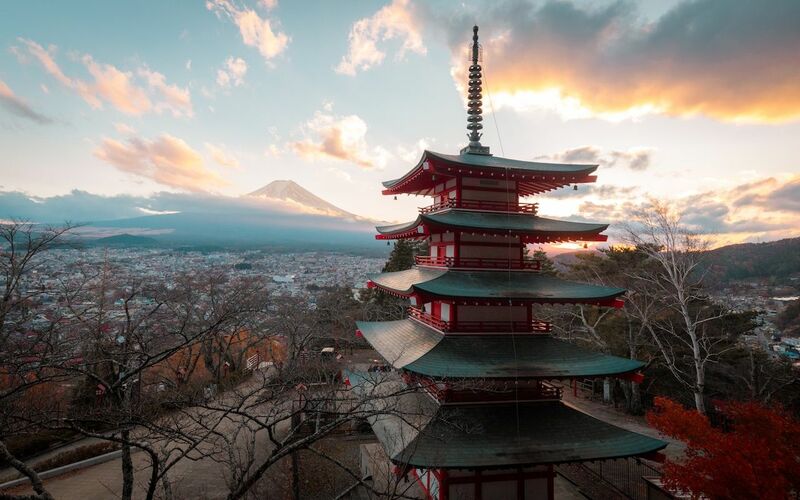 The pagoda and shrine can be reached by a 10-minute walk from the Shimo-Yoshida train station, along the Fujikyu Railway Line, or by bus along the Mount Fuji World Heritage Loop Bus. It can be tough to get a solid nature experience in the heart of a city as busy as Tokyo, but Icho Namiki (Ginkgo Avenue) delivers its fair share of greenery. 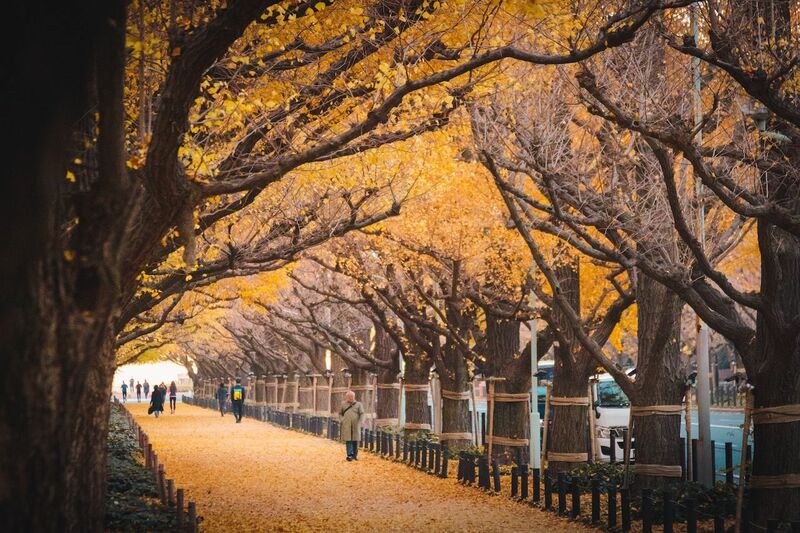 The street is lined with golden gingko trees, and connects the Aoyama business district and Meiji Jingu Gaien Park. Take your time, and stroll at a leisurely pace down this leaf-covered avenue, maybe stopping at a bench or at one of the sidewalk cafes along the way. Getting there is simple, as the street can be easily accessed by public transport. 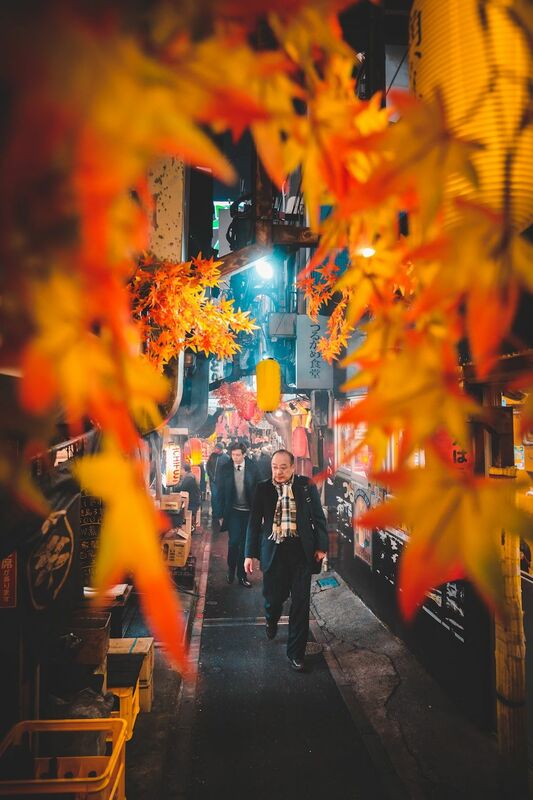 Directly outside of Tokyo’s busy Shinjuku Station you can find Memory Lane, a labyrinth of small alleys filled with authentic Japanese eateries, bars, and lanterns. What started out as an illegal drinking quarter in the 1940s, and then destroyed by a fire in 1999, has been transformed into a place dedicated to preserving traditional Japanese culture. This is the perfect place to try sake, and buckle in for a memorable night out. 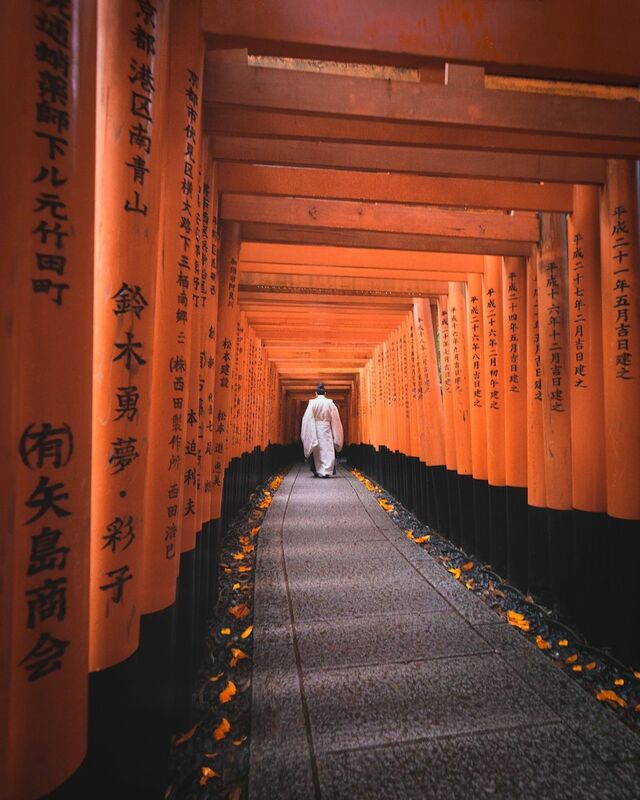 To beat the crowds, it’s best to head to the Fushimi Inari Taisha as early as possible. The shrine in southern Kyoto is famous for its thousands of vermilion torii gates, which lead into the forest of the sacred Mount Inari. Once you’ve thoroughly explored the shrine itself, check out the mountain trails, which are great for hiking. Trekking to the summit of the mountain takes two to three hours, and there are several smaller shrines along the way. On the way up, and especially at the top, you’ll enjoy some pretty spectacular views over Kyoto. I arrived at the shrine very early, at 7:00 AM, just in time to capture this picture of a priest rushing through the maze of torii gates. 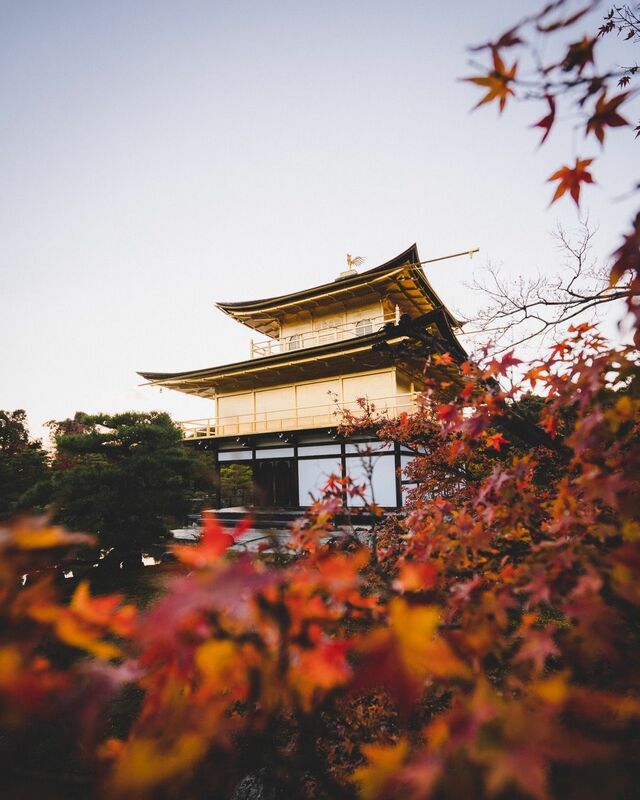 While there are hundreds of temples throughout Japan, Kinkakuji might be the most autumn-esque, as its top two floors are completely covered in gold. Formerly the retirement villa of shogun Ashikaga Yoshimitsu in the late 14th century, and afterward converted to a Zen temple, Kinkakuji overlooks a large pond. Each floor is built in a different Japanese architectural style and the temple gardens have been preserved from the days of Yoshimitsu. Beyond the garden is the Sekkatei Teahouse and a small tea garden, where you can end your visit with matcha tea and other treats. Shinjuku Gyoen gives you a welcome respite from the bustle of downtown Tokyo. It’s the city’s largest park, just a short walk from Shinjuku Station, and its many sprawling lawns are the perfect place to picnic. The park is composed of three different gardens: the Japanese landscape garden, with large ponds, little islands, and bridges; and the French and English gardens, both of which have wide lawns surrounded by trees. Shinjuku Gyoen is also home to several types of trees that change color in the fall, especially the maple trees, which can be found around the Momijiyama (maple mountain) on the park’s eastern side.